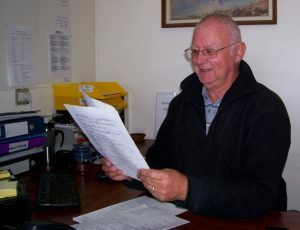 Volunteer profile: Ralph Drage - TADSA - Technology for Ageing and Disability (SA) Inc.
Ralph joined TADSA in 2010. Although he does undertake the occasional project, Ralph’s principal role is our main Project Coordinator. Ralph is usually the first person a client, carer or health worker will speak to regarding the client’s need. Ralph is also the convenor of the Project Team which meets every fortnight to discuss new and ongoing projects. For new projects Ralph will liaise with the most suitable Volunteer/s who will undertake the project. He then monitors the progress of the project and reviews the final product before delivery to the client. Apart from the above, Ralph has redesigned our database and also convenes the monthly Volunteers’ meeting, where Volunteers meet to discuss projects they are undertaking and get input from the group where necessary. The group also undertakes regular facility tours which have included: Levi Strauss Australia’s Distribution Centre, the Desalination Plant, the South Road Super Highway, Coca Cola and Patritti Wines. Why did you join TADSA? I knew about TADSA through my employment with Levi Strauss Australia. The company had a Community Involvement Team which had donated funds to TADSA to purchase an all-terrain wheelchair and two electric page turners. Levi’s received the TADSA newsletter, so I knew a lot about the organisation. I told my wife that I would volunteer with TADSA when I retired, as I wanted a Volunteer opportunity which had some hands on/ practical involvement. After retiring, I painted the house and mowed the lawns and finally joined TADSA as a Technical Volunteer. Not long after, a notice went out to Volunteers looking for a Project Coordinator. My wife said “You’ve been telling people what to do for 40 years so why not apply”– so I got the job albeit still as a Volunteer. What did you do during your working life? I was an apprentice fitter and turner at the Highways Department where I stayed for nine years. Subsequently, I was successful in gaining a cadetship with Simpson Pope as an Industrial Engineer. After three years I moved to Levi’s only Australian factory in Elizabeth (which made 10,000 pairs of jeans per day) working my way up to Engineering Manager. During that time, I also oversaw production facility upgrades in the Asia/Pacific region, which included Japan, Hong Kong, New Zealand and the Philippines. I worked for Levi’s for 30 years (and he has the jeans to prove it!). What is your most memorable project? We made a Mouth Stick Work Station (see picture below) for a client who suffered from Motor Neurone Disease and could not use her arms or hands. The Work Station enabled her to control her environment, entertainment and comfort using a mouth stick. It made such a difference to the client who loved it. Three TADSA Volunteers were involved in completing this project. Trevor Schwartz did the mechanical and woodwork aspects plus setting up the supports for the remotes. 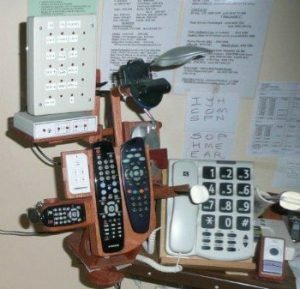 Allan Jeffs designed and built a control box from which the client could open and close her curtains, turn her air conditioner and lights on and off, and adjust the tilt of her chair. Ken Lawson who does the majority of TADSA projects involving plastics, made the mouth stick. The project was completed in quick time by everyone pulling together. © All rights reserved. TADSA.